In the upcoming release of Wonderland, we will be including a set of “starter worlds” for people. In order to help people get the best use of these worlds, in tomorrow’s session, we will be doing a walk-through of the worlds and brainstorming about the best use cases for each one. Then the plan is to “stage” one or two of those scenarios in each world and capture screenshots and short video clips. We will then compile the images and video into documentation that describes how to use the starter worlds. This session will also act as a test of some of the new functionality and bug fixes going into the release. Please note that the session will be held on the community demo server, not our regular Wonderland Wednesday meeting server. If you would like to join us, please follow the link above to the event listing on our Facebook page for more details. Although Thanksgiving is a US-centric holiday, the idea of giving thanks certainly crosses all cultures. In that spirit, I asked representatives of the Open Wonderland Foundation (OWF) board of directors as well as our most active Open Wonderland Forum community members to contribute a line or two about what they are thankful for in relationship to Open Wonderland and our open source community. A huge amount of credit goes to the community for standing up against this flood, rather than being swept away with the tide and abandoning the project. I am thankful to Maria Korolov from Hypergrid Business, the *only* reporter who actually took the time to contact me, for her fair-minded story which helped to turn the tide of doom and gloom coverage to a more positive note (“Project Wonderland developers say they will continue working on the virtual world platform, despite being laid off“). As I’m fond of telling anyone who asks, the Wonderland community today is far stronger than it ever was before “the liberation.” We now have a Facebook presence, a Twitter feed, a community wiki, a wikipedia page, and far more community code and Module Warehouse contributions than we did under Sun’s reign. We also have our community-run Wonderland Wednesday sessions which are a way of “eating our own dog food” and using Wonderland to collaborate in real-time on brainstorming, discussions, and coding projects. So thank you to all the members of the OWF board of directors who believed in Open Wonderland and in me, and to everyone who has contributed to our open source community. The positive, helpful, welcoming tenor of conversation on our forum and in the Wonderland Wednesday sessions is both inspirational and motivating. Lastly, Jonathan Kaplan, our Wonderland Architect, says, “Thanks to the Open Wonderland community for being just that, a community — one that is fun, supportive, helpful, and welcoming to new users and old friends alike.” On behalf of the community, Jon, I want to thank you for your extraordinary efforts in keeping Open Wonderland alive. Your dedication, good humor, patience, and exceptional technical abilities have made it possible for all of us to continue working on this promising technology which, I feel sure, will have a significant impact on the computing environment of the future. obscurity at the hands of corporate myopia. I am grateful for the memory of being a part of a great team at Sun that created Project Wonderland. I’m also grateful for the selection of the open source model that will allow Open Wonderland to continue to fulfill its promise of being a vibrant and engaging medium for learning and collaboration. It is truly a privilege to be a member of the Open Wonderland Foundation Board as we embark on that journey. Open Wonderland has now become fully usable in real world customer projects. The ongoing support of its open source community is really outstanding. and to enjoy the power of your online collaboration. I am thankful for the technology that facilitates and drives such a diverse and active online community. Furthermore, I am thankful for the rich opportunities the community provides to grow as a developer as well as advance technology. Open Wonderland is the first open-source project that I am “actively” following — not as a programmer, but as the coordinator of the ShanghAI Lectures, where we use Wonderland to enable participants from all around the globe to work and study together. We are thankful for the great work and support from the community, without which this project would not be possible. ideas. I am proud to be associated with Open Wonderland Foundation and its members who are are committed to this technology and its advancement in our society. The coming months will see new opportunities and challenges arise, but I am thankful for a group of people from various disciplines that want to carry out this dream. Here at the University of Essex we are very thankful for the help and support of the Open Wonderland community. We are using Wonderland on a range of projects including extending the Mixed Reality Teaching and Learning Environment (MiRTLE) project with new capabilities, and trials planned with students from around the world. We are also using Wonderland as a rich environment for foreign students to carry out virtual tasks with one another and improve their English at the same time. The open and extensible nature of Wonderland makes it ideal for how we need to use it, whilst also allowing us to easily integrate it with the other University systems on campus. We wish every one involved in the Open Wonderland community the best of luck for the coming year. In the context of the ShanghAI Lectures project, a global lecture series on natural and artificial intelligence, we are using Wonderland for group exercises with students from different continents and interactive Q&A session with tutors and lecturers every other week. We are thankful that we have the opportunity to experiment with this leading-edge software which may turn out to be an essential component in how we will communicate and run projects in the future in business, academia, and public organizations. There is a lot of skepticism in companies about the utility of this kind of software but if we don’t do the experiments, we will never know. I am thankful that with Wonderland we have the great opportunity to be part of this exciting endeavor. The iSocial team is thankful for the opportunity to work with “wonderful” colleagues and engage in creative, innovative and fun work to build the iSocial system. It is also uppermost in our thoughts that if we can be successful we can impact and improve the lives of children and families with great needs. Finally, we are truly thankful to all those, especially Nicole, Jon and those working with the OWF Board, who work to continue and extend OWF as an environment for advancing our capabilities to harness advanced technology in the service of education and human needs. As a relative newcomer to Wonderland, it seems that Wonderland *is* all about giving… giving opportunity, a new way to interact and learn, a new way to meet people. Even at a higher level, the community, board members, and developers – they are all contributing. There is *giving* on so many levels. I am grateful for Wonderland, the community, particularly Nicole Yankelovich, for all you have done and for providing an opportunity to be part of this. By coincidence, this article recently appeared in the Wall Street Journal (WSJ) Thank You. No, Thank You: Grateful People Are Happier, Healthier Long After the Leftovers Are Gobbled Up. 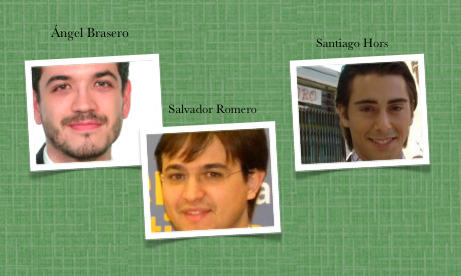 Our guest bloggers today are soon-to-be or recently graduated students at the University of Seville (Spain), and the developers of the open source project Virtual Valley. 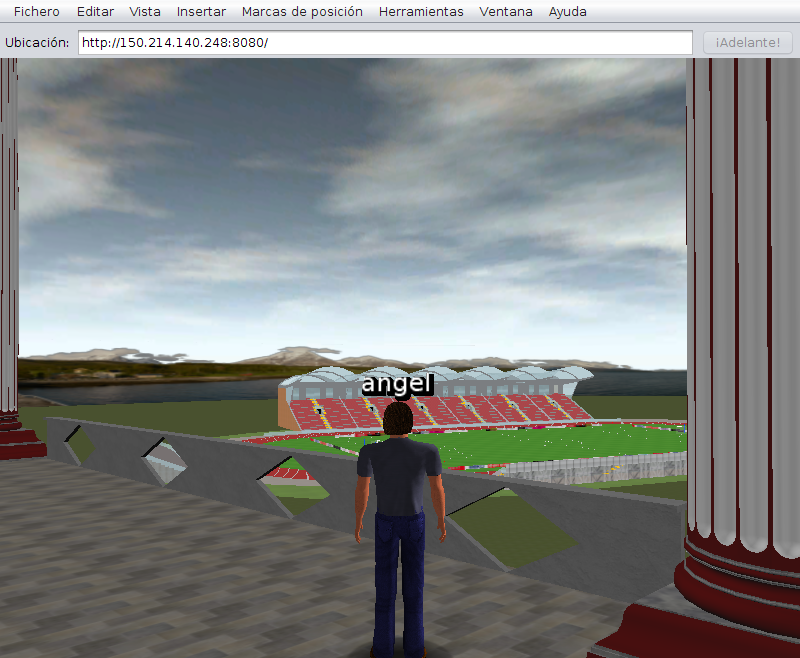 An overview of the Virtual Stadium from the Learning Center. We have been kindly invited to write a post in the Wonderblog by the Open Wonderland staff. Thank you! Virtual Valley is a virtual world to assist patients during physical rehabilitation at home. The world is entirely controlled by low-cost game controllers like the Nintendo Wii Remote, and non-intrusive medical sensors. Virtual Valley is currently in an experimental phase. In its early conception, it was intended for middle-aged people with chronic diseases who need physical rehabilitation to control the evolution of their illnesses. We believe, however, that it can also be useful for athletes and other injured people. One of the most difficult challenges in rehabilitation is to keep the patient motivated once they return home and dealing with the expectation of performing the exercises independently. Based on previous research and experience, we anticipate motivating patients through the use of exergames, education, and the socialization that a virtual world provides. Low Cost: A deployment of a Virtual Valley client only requires a PC at the patient’s home plus some popular game controllers connected to the patient’s home TV. We can also convert affordable exercise devices into wireless smart devices through the use of the game controls. Medical monitoring and personalization: All the exercises and activities performed by the user are registered and can be monitored by a doctor. Exergames can be configured for different demanding levels or even completely different kind of exercises. Socialization / motivation: Patients can meet and exercise with other patients, doctors or even relatives, who can enter in the world to perform keep-fit exercises. Embed existing software: Through the use of Wonderland’s X11 application feature, we can embed previous health and exercise systems into the virtual world, adding the social layer to these legacy systems. We make use of the Nintendo Wii remote, Nunchuck and Wiimotion Plus through a modified version of the open source Wiigee library. We are using Bluecove for wireless communication, as well as the Widdcomm Bluetooth Stack, provided with a $10 bluetooth dongle. We have built our own Java libraries for the Nintendo Wii Board and the Nonin Pulse-oximeter. We have also developed some other libraries to provide abstract functions from the sensors data, such as the WiiMote Pointer, a library that converts the information from the Wiimote IR camera to screen coordinates (avoiding the corner problem present in other libraries), and a mouse and keyboard emulator based on the java.util.Robot class. All this software is encapsulated in a high-end ‘comm library’ that hides the devices to the user, and instead, provides ‘services’ following an event-driven model. All exergames (with the exception of legacy X11 system) are implemented with Wonderland Modules. The comm library described above, in the form of a .jar file, is used by Wonderland Modules to provide a way of communicating with the devices. We also make use of MySQL Database to keep patient data and exergames configuration. There are also other modules such as X11 application launchers and medical information displays. Virtual Valley is an Open Source project developed by master thesis students of the University of Seville (Spain) in collaboration with the Northern Research Institute – Norut (Norway). We expect to have a web site and to start uploading the code soon, focusing first on the game controllers. The project is still in an experimental phase, as we stated before, and under development by undergraduate students at the University of Seville and Norut. We expect to start testing soon with volunteers both in Spain and Norway. Exercising in the Virtual Gym. Some scientific papers have been published regarding Virtual Valley in international e-Health conferences and the IEEE. Salvador’s master thesis was awarded second place in the 2nd Ed. National Master Thesis Award by Sun Microsystems Spain. We wish to thank our tutors: Professors Dr. José Luis Sevillano and Dr. Daniel Cascado (University of Seville), researchers Luis Fernandez-Luque and Dr. Lars K. Vognild (Norut) for their invaluable support and guide, and Dr. Miguel Fernández (Sport Centre at the University of Seville) for his priceless collaboration. Thanks also to Telefónica Chairs for its financial support. Today’s guest blogger is Pradeep Duraisamy. Pradeep completed his B.Tech (Bachelor in Technology) in 2006 and currently works as a Project Associate in a service-based organization. He has 4+ years of work experience in Java, Java EE, and open-source frameworks like struts, springs, and hibernate. In this post, Pradeep talks about development work he performed with Amphisoft Technologies. Thanks Pradeep! Amphisoft Technologies is a private organization founded by a group of “learning” science researchers who developed a thorough understanding of academics, corporate training and technocrat pioneers in enterprise application development, open-source frameworks and tools. Amphisoft’s products are intelligent systems built on five important aspects of learning – Knowledge Creation, Knowledge Management, Knowledge Measurement, Knowledge Harvesting and Knowledge Patterns. Clients use Amphisoft products and services to help streamline training and education, deliver quality education, yet also offer compatibility with existing tools and frameworks for a seamless, integrated user experience. We are using Open Wonderland as a platform upon which we will offer training, hold scheduled meetings and more. We are still in a preliminary state and continue to explore different types of services which we would like to offer through Wonderland. Below are some of the developments we’ve worked on so far. We integrated Moodle with Open Wonderland to revolutionize learning and training. Moodle is a Learning Management System that is a free web application used by many of our clients and institutions worldwide. Currently, there are over a million users registered on Moodle.org. At first we wanted to enable Moodle users to login to Wonderland using their existing username and password. For that, we created a new authentication module which communicates with the RESTful webservice to authenticate users. The web service, in turn, authenticates the user against the username and password stored in the Moodle database. It also sends all the groups associated with the user. By using this group information, we are able to provide a new security mechanism in Wonderland. Our Wonderland server contains many islands which are separated by a long distance. Each island is used for a given course. When a user walks onto an island, a nice capability delivered by another module is that they are able to view all the resources available in that course which displays in a separate HUD (heads up display) window. Users can select a particular resource from that list to load in-world to enable a collaborative learning experience. Users can also be easily transported from one island to another using the portal capabilities and move on to their next course. Below is a screen shot from the course island with the resource module on the right hand side. We are exploring many other opportunities for using virtual learning in education and training. Reducing the initial client startup time. A light-weight client with very minimal modules and functions. It would be nice if all the required modules or functionality in the client are configurable. Accommodation of many more live users in Wonderland. Load balancing or creation of a Wonderland server cluster for improved response times. The Open Wonderland community is doing great work and the forum is very active. We received a lot of support from the community when we faced difficulties while developing our modules. We are very thankful to all the people involved in the community who keep moving the project along even after the company withdrew sponsorship. Continuing with the theme of integrating Wonderland into the wider web, I recently added a RESTful interface to the Web-based Poster Manager module in the modules warehouse. Now, instead of editing the posters from the web admin interface, authenticated users can also use curl (or wget) to view, edit and delete posters. In the video below, I provide a brief demo of using the RESTful interface using curl. curl --cookie-jar cookies.txt --data "username=admin&password=admin"
curl --cookie cookies.txt --header "Accept: text/html"
curl --cookie cookies.txt --header "Accept: application/xml"
curl -X PUT --cookie cookies.txt --header "Accept: application/xml" --header "Content-type:text/plain"
Many thanks to Jon Kaplan for his guidance on authentication. In today’s guest blog post, Warren Sheaffer from St. Paul College in Minnesota reports on a new MiRTLE (Mixed-Reality Teaching and Learning Environment) installation in a high school in Minneapolis. This was made possible by a collaboration with his colleague and Virtual Learning Labs business partner, Michael Gardner from the University of Essex, who attended the event remotely via Open Wonderland. On October 19th, at a well-attended grand opening, South High School in Minneapolis, Minnesota brought the first MiRTLE facility online in K-12 education. MiRTLE classroom during grand opening. MiRTLE, a Mixed Reality Teaching and Learning Environment, is an environment where people gather in both the physical and the virtual world. 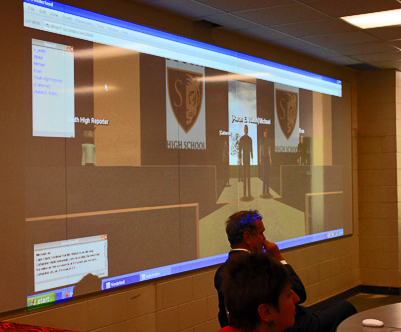 In this case, it is the combination of a physical classroom at South High School in Minneapolis, and the virtual Wonderland South High School classroom where people from remote locations are projected onto the walls of the live classroom. A series of opening remarks were made by the district, the principal, the director of career and technical education for Minneapolis Public Schools, and the President of St. Paul College. In addition, guest speakers from Boston and Great Britain welcomed South High School to the world of immersive education and were present at the event as avatars in the Wonderland world projected on the screen. Michael Gardner, the researcher who developed the MiRTLE technology at the University of Essex, welcomed the students, faculty, and administrators to a new world of distance education delivery. Open Wonderland projected on large screen in the classroom. Aaron Walsh from Boston College and Director of the Immersive Education Initiative also remotely welcomed all participants to this new platform and encouraged the participation of the educators in the Minneapolis public school district to participate in the implementation and development of immersive educational technology. Minneapolis Public Schools has a long history of excellence in innovation and the use of information technology to support primary education. St. Paul College has had a long involvement with immersive education and plans to work collaboratively with Minneapolis Public Schools in the implementation and further development of the platform as an alternate vehicle to deliver curriculum between both the college and college-ready students in the school district. 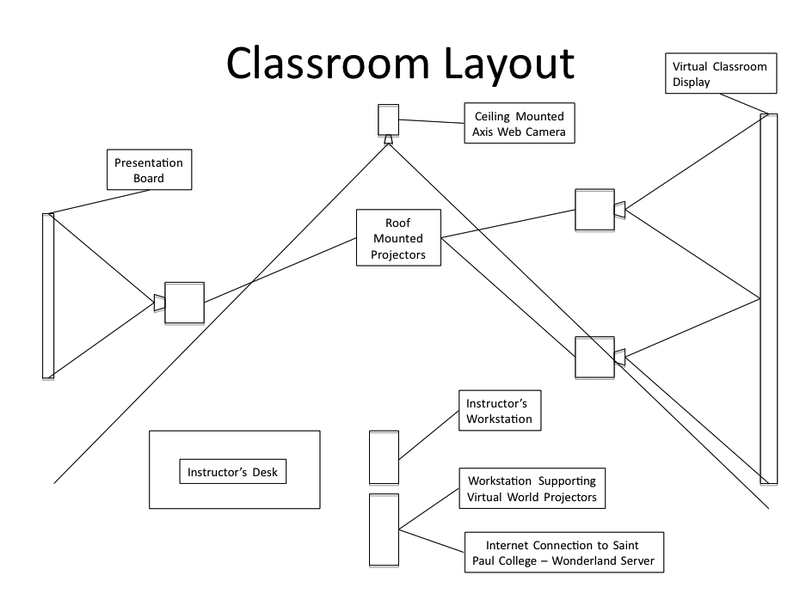 Diagram of MiRTLE classroom layout. The instructor’s workstation, a Macintosh desktop machine, is running a VNC server (VNC is a technology for sharing a remote desktop, and can be used in Wonderland using the VNC Viewer module). This workstation is projected onto a whiteboard in the front of the room and is used to display presentations. Presentation board in the front of the classroom. Avatars of remote students or guest speakers appear nearly life-size on the projected surface in the back of the classroom. The computer driving this projection and running the Wonderland client is a Mac Pro workstation with dual Nvidia graphics adapters. With this setup, the instructor is able to see and interact with a mix of students who are present in the real world and the virtual world simultaneously. While delivering the lecture, the instructor sees the students in the virtual world as if they were sitting behind the students in the live classroom. Audio communication between the lecturer and the remote participants logged in to the virtual world is made possible via the Wonderland voice bridge. The voices of people in the classroom are picked up with a Solo echo-canceling microphone which does a good job of covering the whole room. In the local space, the remote voices are piped into the room using the classroom audio system. The virtual world participants “see” into the live classroom via a ceiling-mounted Axis 212 IP video camera that provides a video stream of the lecture to the virtual world participants. This wide-angle camera provides a view that encompasses the entire room. The Wonderland servers are hosted at the Computer Science Data Center at St. Paul College. There are two Sun 4150 class servers, each with 8GB of RAM, 2 quad core Intel processors, and dual 320GB mirrored SCSCI drives at 10,000 RPM. Each server is running the most recent versions of Solaris 10 and Open Wonderland. Right now the servers are operating separately, but we are experimenting with an extension configuration which will utilize them both simultaneously. Since this is a relatively new technology, applied for the first time in a primary education setting, we all look forward to learning more about how to implement and maintain such facilities so that this information can be shared with the general community. Many thanks to all who participated in this event. Both St. Paul College and the Minneapolis public schools look forward to working with the Open Wonderland and immersive education communities as we learn together. To learn more about the MiRTLE project, please feel free to read our technical report: MiRTLE: A Mixed Reality Teaching & Learning Environment, published May, 2009, by Bernard Horan, Micheal Gardner and John Scott. If you haven’t already seen today’s Immersive Education Initiative press release, here’s an excerpt and a link to the full release. Open Wonderland features prominently! The release includes this video, which I encourage you to watch until the end. Due to our extensive use of open standards, including the WebDAV content repository, Wonderland has been selected as the platform best suited to storing and serving interoperable content. You are currently browsing the Wonderblog blog archives for November, 2010.